“Our own epoch is determining, day by day, its own style. 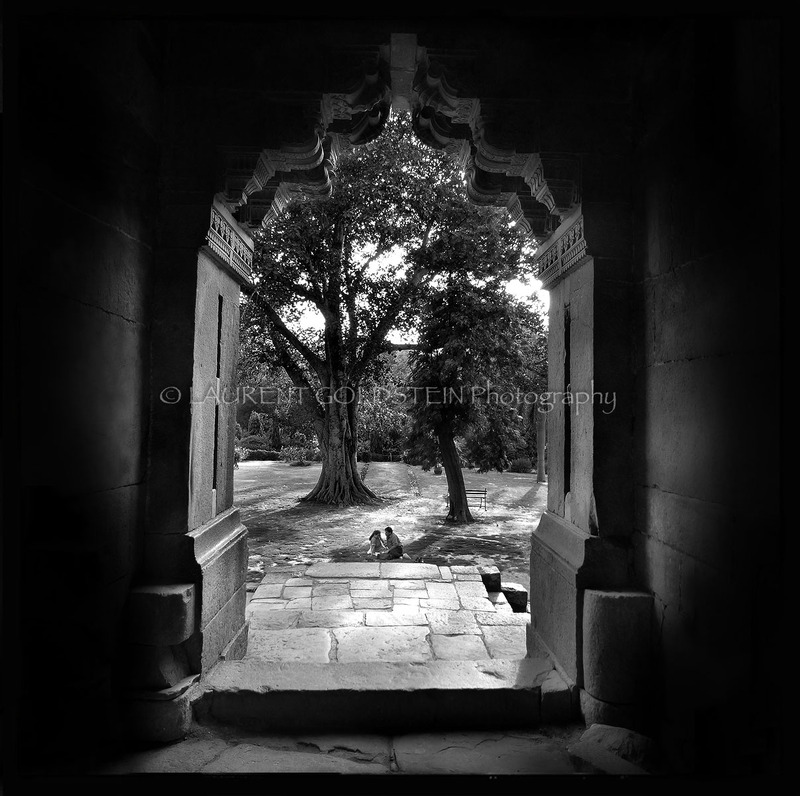 This was shot in Chandigarh, the capital of the Indian state of Punjab. Commissioned by Nehru to reflect the new nation’s modern, progressive outlook, the city was designed by the French (born Swiss) architect and urban planner, Le Corbusier, in the 1950s. It was the first planned city in India and is known internationally for its architecture and urban design. Those geometrical structures made of brick and boulder stone masonry exposed in its rough form produce unfinished concrete surfaces which are the real style of an epoch. 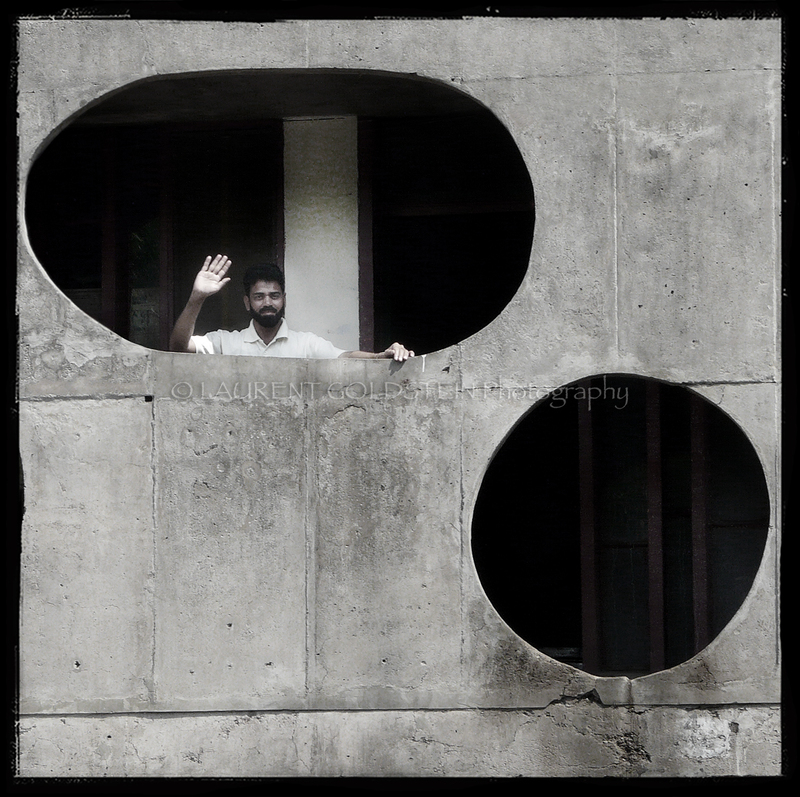 This man was bringing the human touch to the wall and it was fun to play with him and those shapes. This is the largest of the many Open Hand sculptures that Le Corbusier created, it is a 28 meter high version and it stands in Chandigarh, the capital of the Indian state of Punjab. A few years after the Indenpendance, Nehru commissioned the French architect and urban planner to design the city in order to reflect the new nation’s modern, progressive outlook. The birth of this modern, youngest and vibrant city was an act of anguish and drama that took place at the time of partition of India and Pakistan. Lahore, the historical capital of Punjab was ceded to Pakistan and Chandigarh was conceived to be a symbol of India’s freedom. 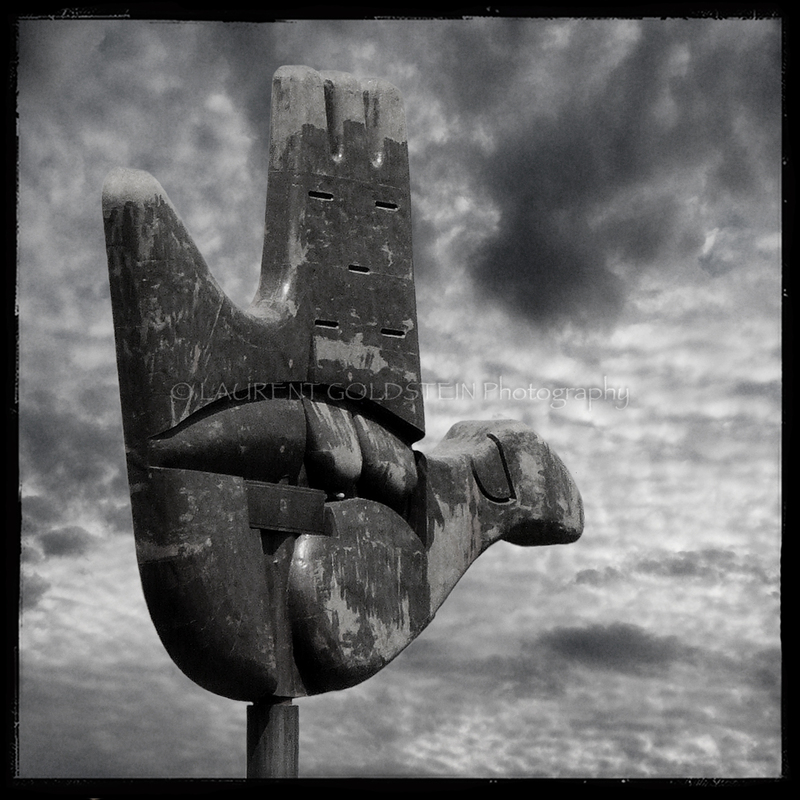 The Open Hand (La Main Ouverte) is a recurring motif in Le Corbusier’s architecture, a sign for him of “peace and reconciliation. It is open to give and open to receive. This man was standing under the sunlight at Nandeshwar along the holy waters of the Ganges in Varanasi (Benaras). “Him whose three places that are filled with sweetness, imperishable joy as it may list them, Who verily alone upholds the threefold, the earth, the heaven, and all living creatures. May I attain to His well-loved mansion where men devoted to the Gods are happy. This man was stepping down Nandeshwar Ghat towards the holy waters of the Ganges in Varanasi (Benaras). This picture is a kind of metaphor in order to emphasize that the area along the ghats is eulogised as Vishnu’s body. Varanasi has 98 sacred water fronts, which are believed to form the cosmic frame linking 14 bhavana kosas of the human body. Among 84 ghats, 5 are considered to be supremely auspicious. These are Asi, Dashashwamedha, Manikarnika, Panchganga and Adikeshava. These are the Panchathirthas, and are believed to be symbols of the cosmic body of Lord Vishnu; Asi at the head, Dashashwamedha at the chest, Manikarnika at the navel, Panchganga at the thighs and Adikeshava at the feet. Manikarnika is considered to be at the center of the 5 thirthas, the navel of the universe from which blooms life. “Poetry is the language of the soul. This picture was shot along the Ganges in Varanasi (Benaras). The ghats are making a music paper where the lines are holding a silent song. Packs and shuts up her gaudy shop”. In my daydreams the ghats take the appearance of staves ready for musical notation and this young man is a clef indicating the pitch of written notes on this poetic music paper. Then the marigold becomes a dotted note on the line. With a little of imagination anything is possible along the Ganges in Varanasi (Benaras).